A tiny house is not just all you could afford or a way to look down on your home. Instead tiny house living is an intentional movement to become minimal and live as efficiently and freely as possible. Whether you want to downsize, whether you want to have a house that is cheaper and easier to maintain, or whether you just love the idea of living in a tiny house this is the book for you. In Tiny House Living you will be taken through the many stages of building, designing and living in a tiny house. You will be told the pros and cons, the difficulties of getting housing permits, how to use your space most effectively and how to find the best location and land for you. With a tiny house you will learn how to live large and truly appreciate the things you have and not allow the things you don't need to control you. Discover what a tiny house is and why people the world over are falling in love with them. Find out the best approach to building your tiny house and how to save money doing it. Learn secrets spots to store your stuff without it ever getting in your way and how to use color and light to make one room seem like three. 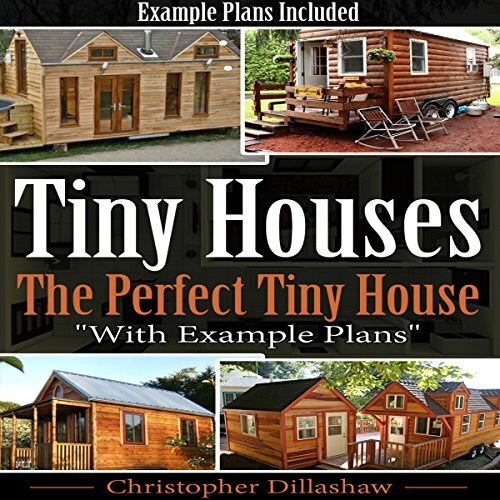 Example tiny plans for your tiny home; five examples to choose from. This is a good book for anyone considering the tiny house alternative. It will also familiarize you with the terms used when discussing or shopping for your first move. If you love tiny houses as much as I do I think you will enjoy this book! This book give a great overview of the tiny house moment. Tiny is the new big. Living economical is becoming more and more popular and this book covers this in detail. Surprisingly unsatisfying with no pictures or diagrams to view during discussion. Would you listen to Tiny Houses again? Why? Yes, Of-course. I will listen this book again and would love recommend to anyone who are going to made a Tiny house. It is necessary to know the advantages and limitations of a Tiny house to build a Tiny house or anyone who are going live small. In this book different construction parameter are described properly. What did you love best about Tiny Houses? Don't spend extra money for extra space. Live economically. Make your living space luxurious with small money. Which character – as performed by Dave Wright – was your favorite? There is no character it's just a narration about the tiny houses and its advantages as well as its limitations. I have loved several thing in this book about Tiny Houses. In this book cost effectiveness as well as minimum requirement for a house are given priority. I have listened Dave Wright in Analyze People and in this book. His narration in this two book are almost same that is very clear and motivated voice. Tiny House with Excellent Plan!